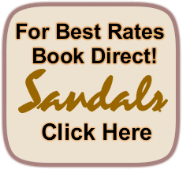 If you have a question about Sandals or Beaches Resorts, click here to get it answered. Leave one copy with relative, friend or neighbor. Leave your contact info (hotel phone) as well. Take one copy with you and carry separate from your passport. Pre-register at sandals.com or beaches.com Be sure to take care of requirements for your honeymoon package if on your honeymoon. Airline Check-In Go to your airline's website at least two weeks prior to travel, access your reservation and provide required information for online check in. Be sure to add frequent flier info if it is not already entered. Then 24 hours prior to departure go back to check-in online (not available for all flights.) If you print out your boarding passes you can go direct to the bag drop line/check in line when you get to the airport. You can also check-in (24 hours prior) for your return trip. Request access to the Business Center at the resort the day before departure. Stop mail, newspapers, milk deliveries, etc. Go to USPS.com to place hold on mail. DO NOT change messages on voice mail to indicate you are out of town for a week. Same goes for your business if it will be closed while you are away. Pets -Don't forget your pets! Make reservations for boarding and/or care and feeding while away. Security System -If you have a security system, change contact information with monitoring company to a trusted friend, neighbor, or relative. Leave them a key and a temporary security code and password for alarm. If you have motion detectors be sure to remove any items that may set them off while gone (helium balloons from a recent birthday party can do this) Placing a couple of cheap kid's toys in yard can help make it look like someone is around. Advise neighbors to be on look out for any unusual activity. Be sure to turn on system as you leave! Green Stuff - Water house plants and mow lawn day before you leave. Water - If possible, turn off main water valve for house. Turning off water should not be a problem in winter. Newer homes should have a valve that turns off house water but leaves lawn sprinklers working. Turn off gas on hot water heater. Cell Phones - You must enable for global roaming before you leave U.S. Even if you have enabled your phone in the past be sure to update roaming programming on your phone a day or two before you leave. YOU CANNOT DO THIS ONCE YOU ARE OUT OF RANGE OF YOUR NETWORK! Airport -If driving, check route to airport for road closures, detours, and delays. Unless you travel to airport regularly for business or work you can get a big surprise! You don't want to miss your flight. If during busy season, make a parking reservation. If you are taking train, bus or other airport transfer check times and make reservations if necessary. Headsets - Even though airlines will sell ear bugs for $5, you can pick up much better and more comfortable headsets at your local grocery, Target, K-Mart, etc. for the same price. Insect Repellent - so you don't have to use the above items! Insulated cooler cup - for those who like more than 6 oz at time and to help keep it cold.